We’ve rounded up and reviewed the best convection ovens for this year 2017 and we’re so excited to share our findings. What we wanted to achieve was to help pick out the most value for your money and to find the oven that has the most features which can really help you with your cooking needs. Before diving into the list though, let’s go through the details. Basically, a convection oven has a built-in fan and exhaust that blows and circulates hot air around the food which helps cook the food more evenly and quickly. Normal conventional ovens or toaster ovens usually does not have this fan and exhaust system and often rely on radiation from the oven walls. The idea of convection technology distributes the heat evenly around the food by removing the blanket of cool air surrounding the food and thus is able to cook the food more quickly and evenly. Why Should You Use Convection Ovens? Faster cooking time: because the convection technology distributes the heat and removes the blanket of cold air surrounding the food, this can help cook the food at least 25% faster compared to conventional ovens. More balanced cooking: because convection ovens blow hot air and circulate it around the food, this will make your cooking more even and you won’t have those “cold spots” in certain areas of your dish. Better browning: regular ovens can create humidity in the air because moisture cannot escape thereby steaming the food instead of roasting. While convection creates a dry atmosphere inside your oven thereby making it better for roasting and caramelizing the sugars faster. This can help get your meats and vegetables better browning. Saves on energy: since you cook your food faster in a convection oven, and generally at a lower temperature than regular ovens, then you can save quite a bit on energy and electricity. To find the best convection oven, we have to look for the best quality of cooking whether it’s for baking, toasting or roasting. We wanted to focus on looking for the best convection toaster oven that can give us that delicious even cooking and roasting. Some ovens might be great for reheating or for it’s toasting, but we wanted the one with the best for all functions. We wanted to focus on getting good quality cooking for meats, vegetables, wheats and breads. Of course, the quality of the cooking may vary depending on how long you’r cooking or what function you’re using but we want to find the best one overall. We wanted to find the best convection microwave oven that looks amazing aesthetically. 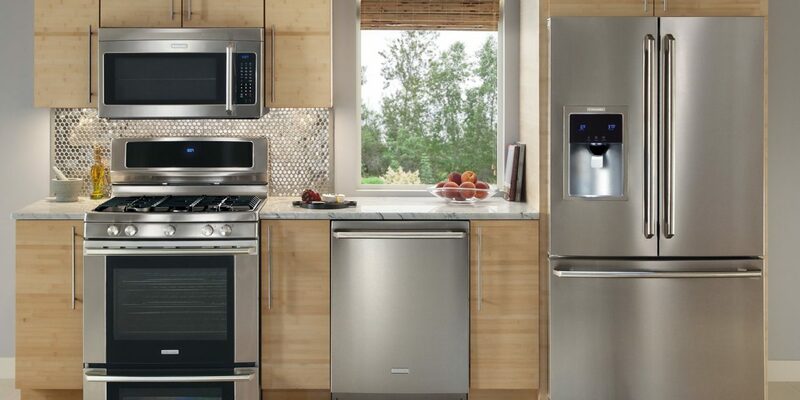 All of our selections have a beautiful stainless steel finish which you can be proud of to show off in your kitchen. The designs are very modern and stylish. Most of them are silver chrome with some having a black chrome finish. Most of all, even if the convection toaster oven is affordable, they should look expensive and not cheap. We wanted to look for the best convection oven that not only can last 6 months but can last for years. Of course, the cheaper ones may be a little bit flimsier but overall, we wanted to look for durable steel material. Most commercial convection oven can be considered very durable but those are expensive. What we focused on are traditional convection ovens for your home for just your daily use. Another thing we looked into is warranty. Most, if not all, do offer a 1 year manufacturer’s warranty for your peace of mind. Most importantly, we wanted to make sure that the best product that we recommend has the most value for money. We did not just choose the most expensive convection oven in the market and definitely did not just go for the cheapest one. We wanted to look for the most affordable convection oven we could find that looks expensive, very durable and has the best cooking, roasting and baking capabilities that you will be happy about. Our Pick for the Overall Best Convection Oven! 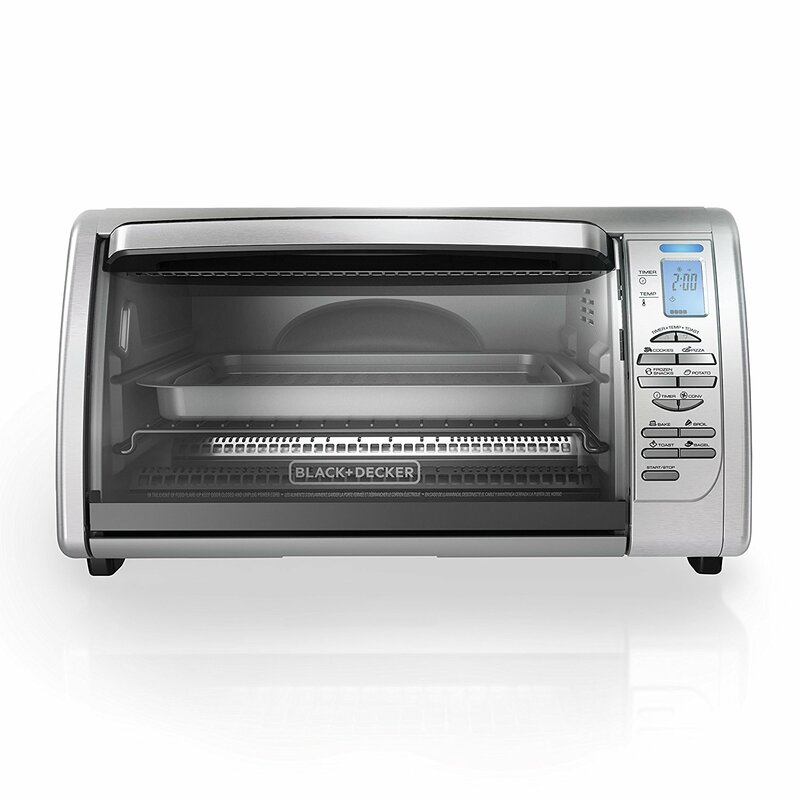 This Breville smart oven pro convection toaster oven is our main pick. It does an excellent job baking and roasting everything from chicken, beef, bread, cakes, pastries, pork loins, potatoes and roasted sausages. The aluminum roasting pan that comes with the convection oven fits perfectly. Aluminum steel finish looks amazing and very durable. The convection toaster oven comes with 10 menu functions. Size is 0.8 cubic foot interior which can fit a 6-slice toast and can accommodate most 3.5 quart Dutch oven vessels with the lid and 5 quart vessels with foil lids. Highly recommended. For those looking for a bigger convection toaster oven, this is the best one for you. It has a large and very spacious interior with a 0.95 cubic-foot capacity which can fit a 13” pizza and 9” x 13” baking pan. It can even fit a 7 lbs turkey breast. It can handle baking potatoes in a convection oven perfectly. The oven toasts and bakes beautifully and the food comes out evenly cooked with delicious and juicy fillings. 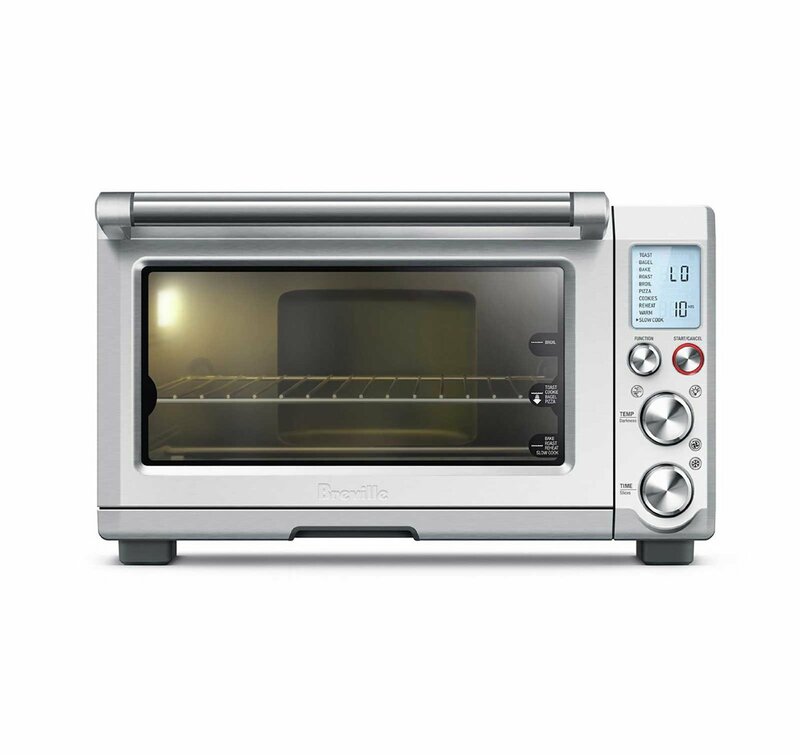 This convection toaster oven is beautiful with a stainless steel finish and interior includes oven light and non stick coating. It also includes additional accessories such as 2 oven racks, backing pan, broiling pans and a 13 inch pizza stone. 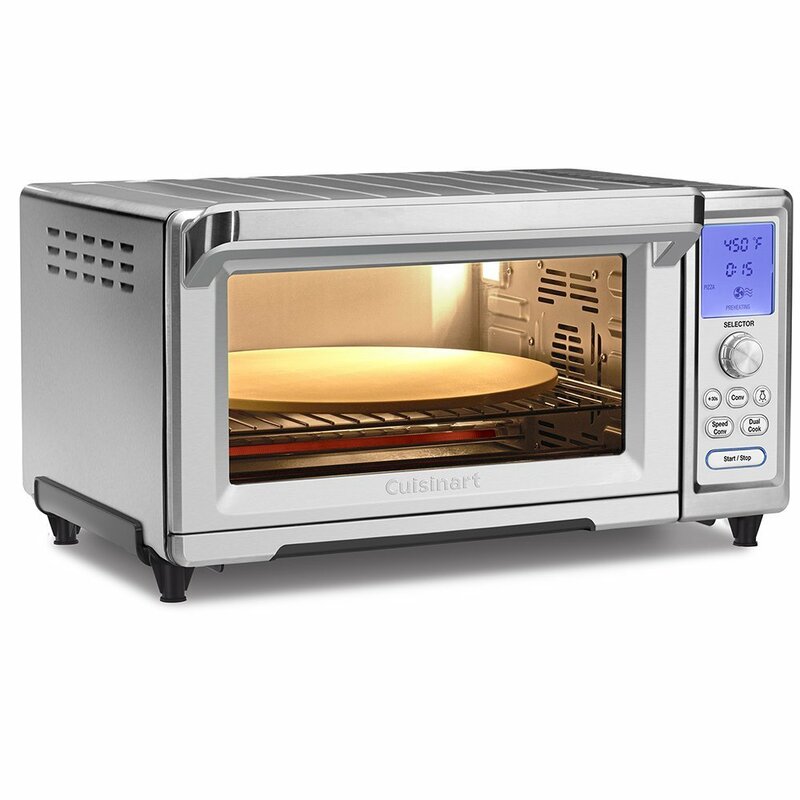 We highly recommend this convection toaster oven for those looking for a bigger but still manageable convection toaster oven. 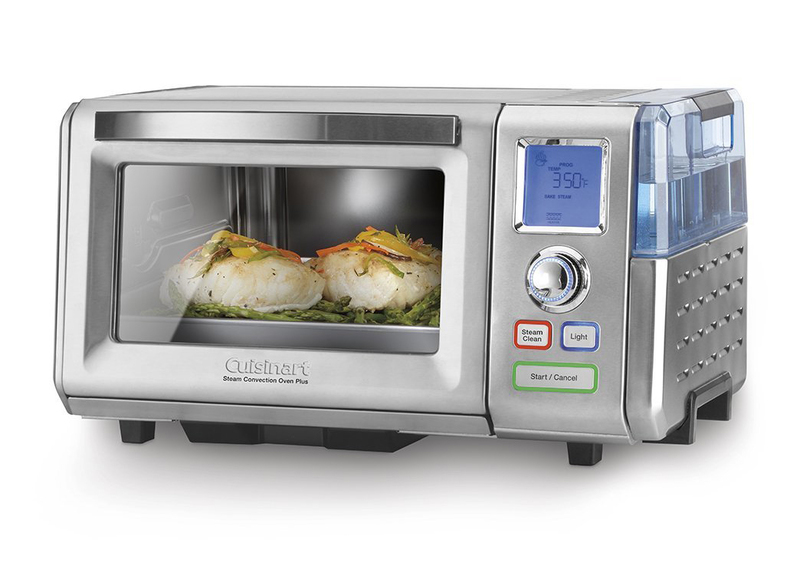 This Cuisinart convection oven uses both convection and steam technology. This is not your standard toaster oven and can nearly replace your microwave and stove for day to day use. The steaming technology helps to perfectly heat and cook vegetables, breads and grains without using steamers or rice cookers. Has 9 unique functions to choose to cook your food. It has toasting, convection baking, steam baking, roasting, steam, broil steam, super steam and breading. The convection toaster oven looks amazing with the all stainless steel finish. Quality of the oven is amazing and accessories are high, durable steel. The LCD is easy to read and looks great. And the setup is very easy. This is more of mid-size convection toaster oven on a budget but it comes with good value for money. Comes with 8 one-touch menu functions from Bake, broil, toast, bagel, pizza, frozen, snacks, potatoes and cookies. The baking and toasting power is pretty good for a mid-size toaster oven. The interior of the oven can fit a 12” pizza with 6 slices of bread. It’s not the biggest toaster oven but if you’re looking to save space on your countertop, this is definitely a good and reliable convection toaster oven for you. 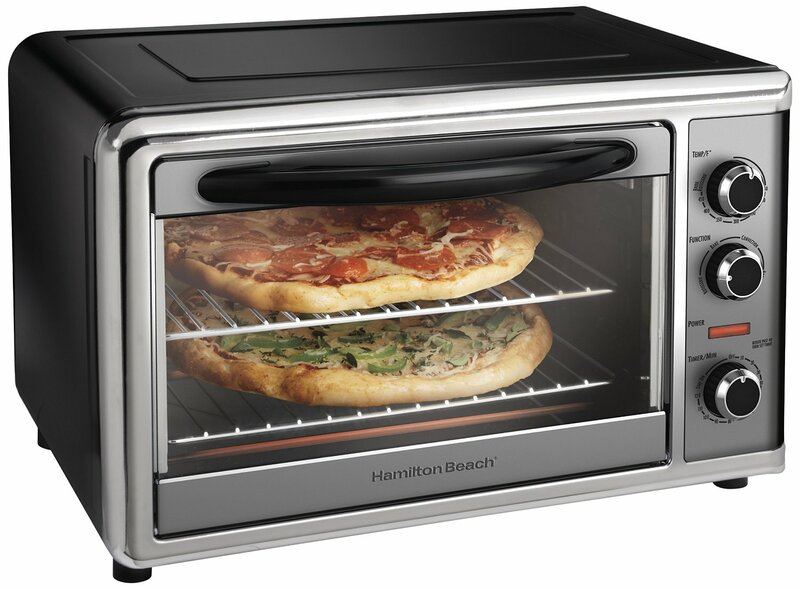 Another mid-size convection toaster oven on our list, Hamilton Beach has been very well known to make good quality microwaves and toaster ovens for a decent price. This is another good option for those looking for a good quality convection oven on a budget. The interior can fit two 12” pizzas, two 9” x 13” casseroles or two cake pans which is very generous in space for a midsize convection oven. It also comes with a revolving rotisserie option which can fit a 5 lbs chicken. The unit itself has a very nice silver steel finish for the front and a black body. Very nice for those looking for a convection toaster oven that just works as intended.